The roads leading to megaliths have a certain “Arizona highway” charm. April 11, 2015. 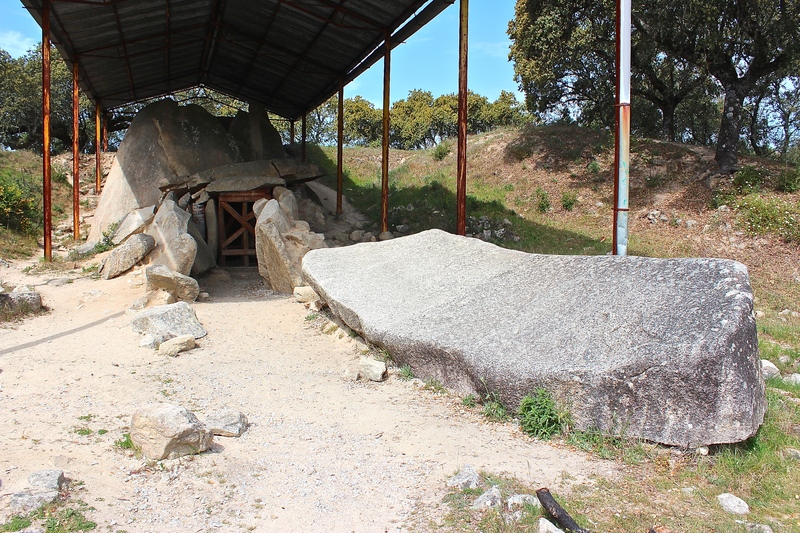 Easter morning, on our way out of Évora and heading towards the Algarve, we decided that we still hadn’t had enough of heathens, so thus began our hunt for megaliths — huge stone slabs erected by Neolithic peoples to mark graves or track celestial happenings (think Stonehenge). Southern Portugal has its fair share of these structures, all of which are scattered along country roads that challenged our navigational skills and left our little rental car coated in dust and begging for a front-end alignment. “… and the stone was rolled away.” One of the tallest of its kind, this dolmen was completely covered with a mound of dirt when it was discovered. It’s now in danger of collapse due to its exposure to the elements. Our appetites now whetted for more Neolithic sites, we next headed to the Cromeleque dos Almendres, a sort of Portuguese Stonehenge. On the way to the main event, we encountered the Menhir of Almendres — a single, 10-foot-tall monolith that seems to stand sentry to the bigger site nearby. The top portion of the stone is etched with a shepherd’s crook, which is typical for pastoral Neolithic peoples. And like most standing stones, it marks one of the all important agricultural and astronomical mile-markers, the winter solstice, by lining up with its nearby buddies to point toward the rising sun on the shortest day of the year. The lone menhir stands looking towards the distant stone circle. Look closely, and you can see the shepherd’s crook curling up and to the left. The giant stone circles themselves — really more ellipses, although at one point they may have been horse-shoe shaped — sit not too far away and are made up of 95 rounded granite boulders, arranged in dual concentric rings, one large donut connect to a smaller one below it. Both are oriented northwest to southeast to create a sort of crude astronomical observatory or celestial calendar marking the movements of the moon and sun during equinoxes and solstices. The surface of several of the stones carry engravings of shepherd’s crooks, “cup marks,” spirals, and serpentine shapes, leading some archaeologists to think that the site may have also acted as a giant family tree, tracing ancient lineages of leaders in the region via clan symbols that acted like “family crests.” But no matter the meaning, cultural or celestial, the space definitely has a sacred feel, even on a hot summer day with tourists testing the acoustics and little kids playing hide-and-seek behind the brooding boulders. The cromeleque is one of the oldest megalithic monuments in Europe, about 2,000 years older than Stonehenge. Note the circles engraved on the stone. These may function as clan symbols. Several upside-down shepherd’s crooks can be seen on this stone and may have also been kinship symbols or marks indicating powerful leaders. Archaeologists simply re-erected the stones where they had fallen over time, but further research shows how their positions changed throughout the Neolithic period. Recent studies show the stones were erected in different building phases, the earliest being a simple, perfectly round circle and the latter being two ovals or horseshoes, one large atop a smaller intersecting one. In the last phase, rather than functioning as an observatory, the stone circles may have been used more for ceremonial or religious purposes. Supposedly the three stones in the center once marked graves of ancient leaders. I borrowed this aerial shot courtesy of the Évora tourist website (http://www.evora.net/) so that you can see how the stone circles are laid out, one big donut above a smaller one. As we left the site, Matthew and I admired the peace of the place. Fields full of wildflowers basked in the sunlight and waved in a breeze redolent with the scent of Spanish lavender in full bloom. Beautiful cork oaks offered us a shady spot to sit and admire the amazing variety of birds that sheltered in their branches. I heard my first real cuckoo that day, as the bird’s distinctive call echoed through the trees. Spanish lavender frolics beneath an evergreen cork oak tree (Quercus suber), numbered to indicate when it was last harvested. A tree must be 25 years old before its bark can be peeled, which takes place every nine to twelve years thereafter. Cork forests harbor around 135 different plant species per square meter. That’s some pretty intense biodiversity. A beautiful lupine growing beneath a cork oak tree. Cork oak forests also shelter a number of critically endangered animals, such as the Iberian lynx, Barbary deer and Iberian imperial eagle. Portugal produces around half the world’s cork. Spain supplies the rest. Once harvested, the bark of the cork tree is boiled, then flattened into thin sheets that get shaped into an astonishing variety of products. Since cork repels water, it’s a great material for shoes of every conceivable style. Check out the awesome Sherlock Holmes Macintosh, luggage, and lacy dress made of cork. 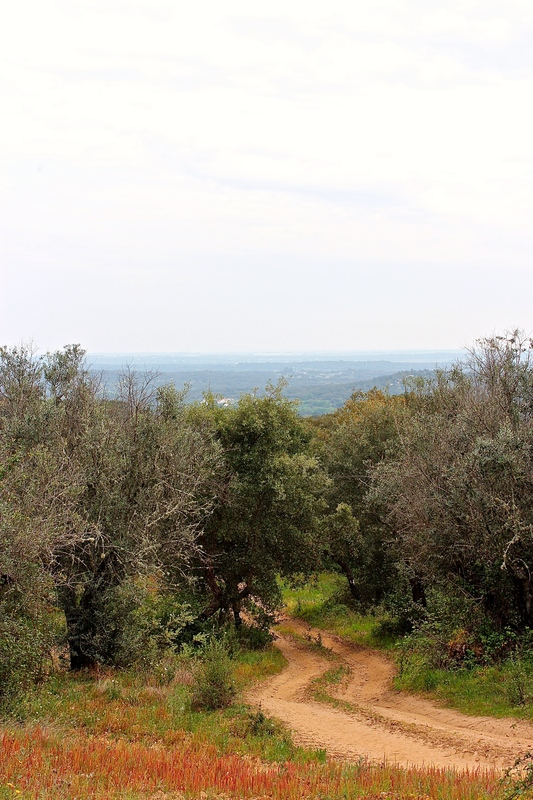 Our megalithic meanderings done for the day, we sped towards the Algarve, stopping along the way to admire vast wetlands and marvel at the nests of storks perched precariously atop high-tension towers, telephone poles, and chimney tops. (Guess what behavior spawned the fable that the new baby arrived down the chimney via special delivery by a stork?) These bizarre locations for setting up house were a constant source of amazement to us, and we probably initiated several near-miss accidents in an attempt to pull off the road and take photos. White storks (Ciconia ciconia) build huge nests of twigs to hold their clutch of four eggs. A gorgeous wetlands on the way to the Algarve. At last we reached our destination, the Algarve, home to some of Europe’s most ruggedly beautiful beaches. Our plan was to simplify our sightseeing and spend more time relaxing, beginning with a stay at the Villas Dom Denis. Super quaint and comfy, the place had several pools and a beachy vibe meant for lazy days sipping tropical drinks and getting tan lines. But as luck would have it, the day we arrived, a storm front blew in, dropping the temperature to around 50 degrees and hiding the sun for the next three days. So much for swimsuit weather. Guests can relax on the awesome veranda at Villas Dom Denis. Each cabana has its own little porch. One of the gorgeous poolside spaces. Matthew and I spent hours hopscotching our way along the shoreline, climbing through tunnels, egg-shelling barefoot over barnacle-encrusted rocks, and plotting pathways around rocky points where the incoming tide threatened to cut us off from the next patch of sandy beach, barely visible around the distant bend. A network of nature trails high above the water not only gave us a bird’s-eye view of the beautiful coves below, but also provided opportunities to explore the amazing plant diversity when high tide made beach-combing impossible. No words really describe how gorgeous the area is, so I’ve created a huge gallery below for you to enjoy. Fossilized sand dollars embedded in the sandstone. Check out the little beach cabana for snacks and drinks. Matthew gets his tooties wet in the frigid water. Flowers along the nature trails above the beaches. We tried to rent kayaks for a closer look at the formations, but no such luck due to the weather. Bummer. Note the fishing boat on the horizon. Check out the sea cave. The cliffs harbored lots of bird species. That night, we headed into the little beachside town of Lagos for dinner and spent some time perusing cute lanes and alleyways to admire the whitewashed architecture and bask in the overall funkiness common to most seaside resorts. The next morning, we tried to take in a few more sites like Fort Ponta da Bandeira, but the windy weather drove us back indoors to the cliffside Cafe do Mar for a wonderful meal of freshly caught golden bream and sea bass. A plaza space in Lagos. The cliffside Cafe do Mar. More gorgeous cobblestoned sidewalks — with a maritime theme. The 17th-century Fort Ponta da Bandeira, which defended Lagos against Spaniards and pirates. With only one afternoon remaining before our trip home the next day, we headed out to our last beach — the Praia do Castelejo — located near Cape St. Vincent, which was once considered Land’s End and is still the farthest west you can go in Europe. The trip took us through a nature preserve that reminded us of the Scottish moors with its steeply rolling hills covered in twisted fairy forests, shrubby gorse, and an incredible array of wildflowers. Our impression of the Scottish highlands seem cemented when we ran into a flock of sheep being herded under the watchful eyes of a shepherd and his sheepdogs. Matthew having a “the hills are alive” moment. A Portuguese shepherd and his flock. But when we finally reached the shoreline, we felt as if we’d been transported to some volcanic desert island, where the beaches are made up of black basalt slabs jutting upwards to stab at the sky. A huge group of surfers tackling enormous waves increased the Fiji-like feel, and we watched for awhile to see which folks made it back in one piece. A final stroll along the sand provided us with incredible photo-ops and memories to carry home, fueling dreams of another visit someday … perhaps when it’s warm and sunny, dare I hope? Totally looks like the black-lava coastline of Fiji, right? In actuality, the rock formations here aren’t volcanic; they’re sedimentary, made up of sandstone and shale laid down where ancient rivers formed deltas along the ocean coastline during the Palaeozoic Era (544 – 230 million years ago). Someone else seems as enamored with the country as we are, having paid tribute with this rock altar. An animal lover has made an homage to his or her favorite marine critters. Doesn’t the sandstone tower in the distance look like nature has built it’s own lighthouse? I now see the appeal of surfing. Here you can see a standing shale deposit, laid down long ago by a river that flowed out into the sea. It’s been tilted upward by tectonic action — movement of Earth’s geological plates — over many eons. Check out the amazing shale deposits along the beach. You can really see how tectonic action has warped and folded them into fantastic shapes. A rock arrangement that could compete with an Andrew Goldsworthy construction. Yep, it’s a little windy along the bluff. But an up-close view of the wildflower-strewn hillside is worth a funky hairdo. I am going to see if my patio guys can recreate that octopus mosaic on the new patio… I will also need a drawbridge though. I think I can find a couple samples for you to copy here in Norway.